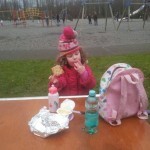 Winter picnic- but don’t forget the gluten free crisps! Hey there to all Veronica fans. It’s Sarah here again. Hope you all had a fantastic Christmas and New Year and that “Santy” brought what you wanted. To be honest, our own Christmas was a bit below par as we had a sick house. Now this was an all-new experience for me as we are normally very hardy folk; but since the end of November, one of us has been complaining of something or another. There was plenty of the vomiting bug to be dealing with and the poor little 5 year old had over a week of it before Christmas and for the week afterwards as well. To say we were cooped up and suffering from cabin fever is a major under-statement! Anyhow, Sunday morning came and no one had a temperature, YIPPEE! We decided to bundle up in plenty of layers and go to the park. We live in South Dublin so there are plenty of parks to choose from – for a change, we chose Corkagh Park just off the N7 near Clondalkin. 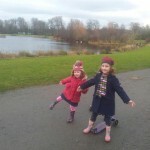 It’s a great park – it has a huge playground (albeit strangely gravelled; but in the current warm and damp conditions that was nearly a bonus as there was none of that “it was bark, now it’s a bog” thing going on) and a free pet farm, fishing lakes and a little coffee shop…. We got the scooters and as it was dry I decided to bring lunch. A winter picnic, what a lark! I threw a packet of Philadelphia garlic cheese spread, a packet of cream crackers, some apples, bananas, a knife and the ubiquitous packet of baby wipes into a small bag and off we went. Great craic was had by all – lots of scooting and the 3 year old was even finally persuaded to try the “big” slide on Daddy’s knee. After that she was good to go by herself! There are picnic tables dotted around the playground area too, so I was able to catch up on the Sunday papers while the girls played on. But oh no… BAD MUM ALERT! Guess who forgot the crisps?! Oh god, the level of moaning… At least though, we now had a “reason” to leave the playground without the usual roaring and bellowing. So we scooted back to the car (the great thing about those scooters is that they are very easy to push when the children get tired and after all that sickness it was handy), got home and HAPPY DAYS! 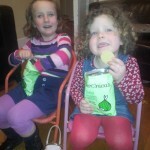 Crisps in hand – or rather; baked, organic, gluten-free snacks; two pleased, flushed and tired little girls allowed a little TV time and Mum is a allowed a guilt-free cuppa with the Sunday papers (an a packet of Veronica’s Snacks too, shhh! ).